Be hair-free and carefree with Venus Versa Hair Removal! This technology makes it easy to say goodbye to unwanted hair growth on any area of the face or body! The Venus Versa not only makes treatments faster, but its advanced cooling technology makes hair removal treatments more comfortable than ever - it's virtually pain free! 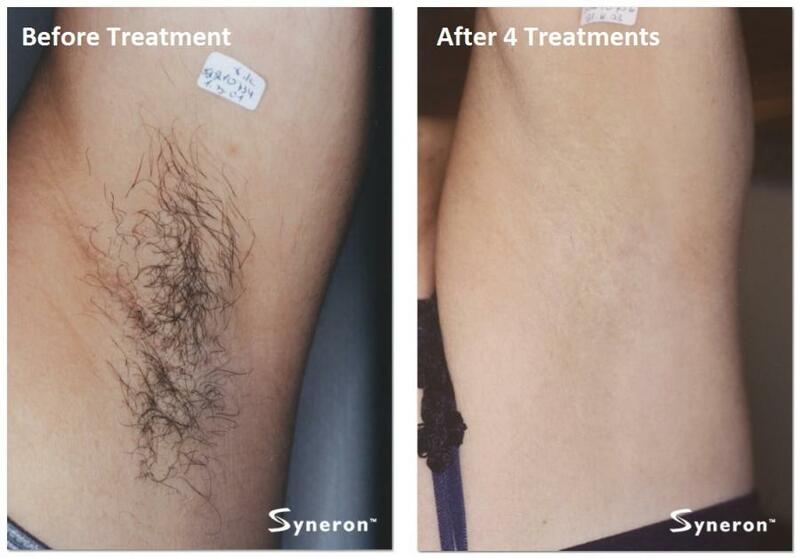 Achieve permanent hair removal, both safely and effectively, without any downtime and minimal discomfort! Most hair colors can be treated, and treatments are safe for nearly all skin types! Just about any skin type and a variety of hair colors can be treated. Practically any area of the body is treatable - upper lip, cheeks, sideburns, chin, neck, back, shoulders, chest or breasts, stomach, arms, underarms, hands, bikini, legs, feet, and more. Ideal conditions for laser hair removal are dark, coarse hair and a lighter skin type. But don’t worry if you don’t exactly fit these criteria, it does NOT mean that you are not a good candidate. People of all skin tones and hair colors have experienced great results. Lighter hair colors just may require several more treatments as compared to darker hair colors. We recommend a complimentary consultation if you are interested in seeking hair removal treatments so that we can answer any questions you may have and provide realistic expectations for you personally. During the consultation, our trained professionals will evaluate area to be treated, determine your skin type, and establish a treatment schedule and cost. All of which will make you much more comfortable when you come in for your first treatment. Roughly 2 weeks after a treatment is when you should see some follicles shedding hair. The hair will simply fall out of the follicles that were successfully targeted and destroyed during treatment. However, keep in mind your hair grows in stages and results are gradual and cumulative. Hair growth should be reduced to some degree after each treatment. When hair grows in between treatments, there is usually less of it, and it will be finer, lighter and slower growing. The amount of hair loss following each treatment will depend the hair color and coarseness, skin tone, and the area of the body being treated. Some clients have noticed results even after their first treatment, but generally, significant results can be seen following the 3rd or 4th treatment. You can shave... and then that you don't have to! Unlike other hair removal procedures, you can shave as often as you like throughout the process until results are achieved. Then the benefits include minimal risk of razor burn, cuts and ingrowns! Precision. Certain light energies have the ability to selectively target hair, leaving the surrounding skin undamaged. In addition, the laser can treat nearly any area of the body – including areas where the skin folds or bends as well as small areas such as the fingers. Speed. We aren’t limited to treating each follicle individually (such as electrolysis treatments); We have the ability to treat many hair follicles at once. With each pulse of energy taking only fractions of a second, treatments are fast! After one pulse, the applicator is immediately ready to pulse again, so treating a small area, such as the upper lip, may take only a few minutes. This advanced technology allows us to treat larger areas in a shorter amount of time such as minutes compared to what used to take hours just for one area. The Venus Versa is so efficient that only one pass over the area is necessary for optimal treatment, so you don't have to worry about having essentially two treatments in one session. Noticeable Results. Most clients see permanent hair loss after an average of 3 to 5 treatments, and many see some reduction even after 2. With each treatment, the treated area will likely feel both less coarse and less dense. 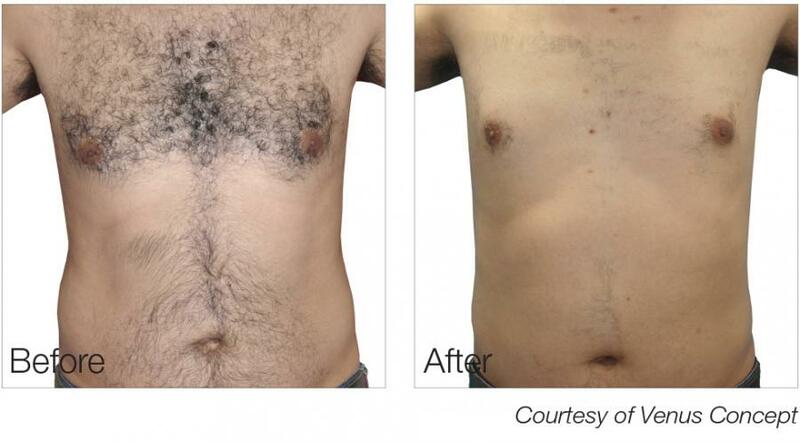 Laser hair removal is permanent, so each follicle that is effectively treated will never regrow hair. Safety. The Venus Versa not only makes treatments more effective, but safer too! It operates more efficiently than other technologies, so less light energy is delivered to the skin as compared traditional photothermolysis methods. It is so efficient that there is rarely any skin reaction to the energy, such as redness and inflammation because we aren't using more energy than needed to successfully target the hair follicles. Side effects such as blistering or scabbing are extremely rare. There is NO downtime! Hair grows in stages and it's only during its growth cycle, when the hair is still in its follicle, that the removal process is most effective. The Venus Versa Hair Removal applicator combines a high level of light energy, Intense Pulsed Light (IPL) technology, with maximum heat distribution to multiple hair follicles at a time. IPL energy penetrates into the deeper layers of the skin, precisely targeting the pigment in the follicle beneath the skin's surface, but without damaging any of the surrounding tissue. 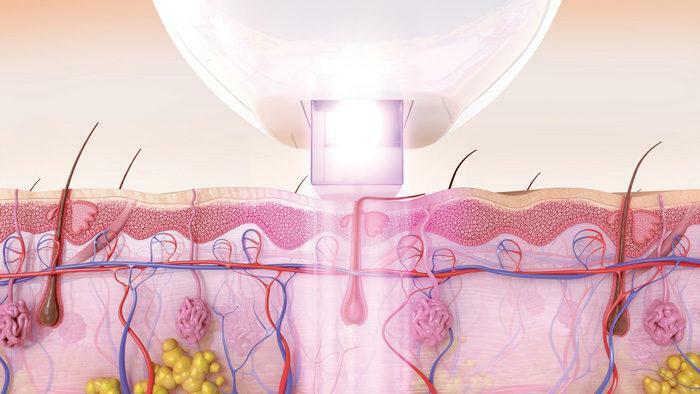 Light energy is delivered to the skin via hand-held applicator. Contact is made with the skin and cooling begins. IPL selectively targets the pigment inside the hair follicle building up heat and causing the unwanted hair to shrink and become eliminated. This build up of heat damages the hair follicle beyond repair, rendering it no longer capable of growing a hair. During a single treatment, only follicles that are in the active growth stage can be destroyed. Since hair grows in stages, multiple treatments are necessary to permanently reduce all or most of the hair from an entire area. It is important that your treatments are completed according to the recommended schedule so that essentially all active hair follicles can be treated at the active growth stage. Advanced cooling technology provides a more comfortable experienceand ensures the skin is protected from heat. Nearly all skin types can be treated safely and effectively. YES! Because hair on the body grows in stages, you will have multiple treatments at recommended intervals so that virtually all hair follicles can be treated at the time of active growth. Once an active hair follicle is thermally destroyed by the laser, it cannot ever grow a terminal hair again, and the existing hair will simply fall out. With each treatment session, the number of follicles that are growing hair is reduced… permanently. Although laser hair removal with elos technology is permanent, there are millions of follicles on the body that can potentially grow hair. First, it isn’t quite realistic to expect that every single follicle will be disabled, however you probably won't notice if a few stubborn hairs remain after your treatments, as they will likely be very thin and light in color. Second, not all hair follicles on the body are active, and as you age, follicles that have been dormant or inactive may later become active due to internal physiological changes, such as hormonal imbalance, pregnancy, menopause, disease or medications. If you are seeing several new hairs after completing your initial series of treatments, a few follow up treatments may be desired. We offer follow up treatments at a discounted rate so you can continue to maintain your results throughout all stages of life! Although laser hair removal has never been known to feel good, hair removal treatments with the Venus Versa have never been more comfortable! Advanced cooling technology built into the applicator regulates cooling during treatment and significantly improves client comfort. There's no need for a separate cooling machine or ice pack of any sort. At it's worst, you may feel a slight "snap" typically over more sensitive areas. In some areas, you may feel nothing at all. Each pulse lasts only a fraction of a second, and treatments are very well tolerated. Previous technologies typically caused skin reactions such as redness and tenderness after treatment, but this is hardly experienced with the Venus Versa. Your treatment professional will perform test spots to determine the most appropriate settings for your skin type and provide an optimal treatment that is both comfortable and effective. Clients who have had hair removal treatments with other technologies and/or methods of hair removal have said that Venus Versa treatments are far superior in level of comfort, and many will agree that Venus Versa treatments are a better alternative to a lifetime of shaving or waxing. Discontinue use of any irritant topical agents, such as Retin A, at least 3 days prior to treatment. During your treatment series, you should refrain from tanning. If sun exposure (natural or artificial) cannot be avoided, you should use a high factor broad spectrum sunscreen to protect the skin. If you already have tanned skin, it is recommended that you wait at least 2 weeks or until the tan fades before starting the treatment process, as tanned skin will make your treatments less effective. Also, because the laser targets the pigment of the hair, refrain from tweezing or waxing for 6 weeks prior to treatment, as these practices temporarily remove the hair and its root and with no hair present, treatment is ineffective. However, you are free to shave as often as you like. 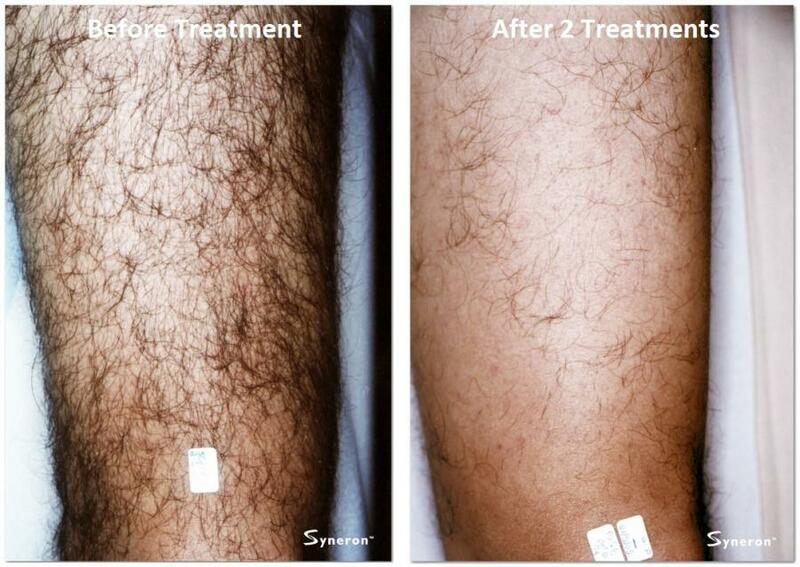 You will need to shave the entire treatment area the day before or on the day of your laser hair removal appointment. You will be provided with proper eye protection to wear during the session. When we are ready to start, a gel will be applied to the treatment area. The applicator is placed on the skin and cooling begins in preparation to counter heat from the light energy. Your treatment professional will make adjustments to the settings as needed and conduct several test spots to monitor the skin’s reaction and ensure treatment settings are appropriate for comfort and effectiveness. You will feel light pressure and coolness from the applicator, as it must have full contact with the skin. You may feel a light "snap" or you may not really feel anything as the energy is delivered into the skin. After the settings have been established, the entire area will be treated by moving applicator the applicator over the skin and pulsing. After a single pass of pulses is applied to the entire area, the gel is gently wiped from the skin. Immediately after treatment, the skin may feel slightly warm or sensitive on the surface, but this is typically uncommon due to the applicator's efficiency. Generally, your skin feels absolutely normal when you leave. You may experience some redness around the follicles for a few minutes to several hours after a treatment; this is uncommon but normal and can occur. There is absolutely NO downtime. You can wear makeup and return to your regular activities right after your appointment. Avoid hot baths or showers for several days. Avoid any abrasives such as scrubs or exfoliating sponges for up to one week. Refrain from tweezing or waxing in between treatments. You MUST use a high factor broad spectrum sunscreen (at least SPF 30) daily and for at least one month after your last treatment. Wear protective clothing or a hat and reapply when sun exposure cannot be avoided. Daily use of spf is extremely important, as tanning and UV exposure may cause hyperpigmentation. Feel free to call our office if any questions or concerns arise post-treatment. Typically you will need at least 6 treatments to achieve the desired end result. Certain individuals may require several additional treatments to achieve their desired end result. The total number of treatments needed will depend on your skin type, as well as your hair color and density. Darker skin types, lighter hair colors, and/or finer hair may require additional treatments. For optimal results and to minimize the total number of treatments needed, adhere to your treatment schedule throughout your series of treatments. Laser hair removal treatments are generally scheduled 4 -6 weeks apart for facial areas and 6 - 8 weeks apart for body areas so that hair follicles are treated at during the growth stage. Treatments are very fast, but the total time will depend on the size of the treatment area. Take advantage of a free consultation to establish your personalized treatment schedule. Treatment costs will vary depending on the area of the body to be treated. Schedule a personalized consultation with one of our treatment professionals free of charge to ask questions, walk through the process, and establish how much your treatment will cost. 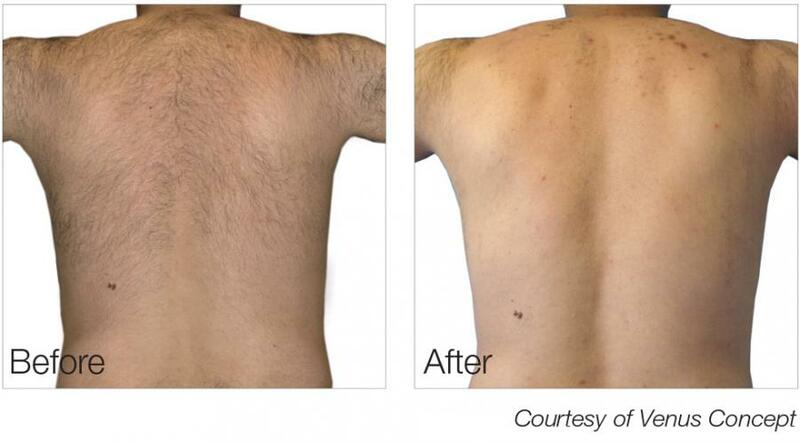 We do our very best to be competitive and make laser hair removal affordable for our clients. Pay as you go or take advantage of our package pricing - prepay for your treatment series and receive a discount! 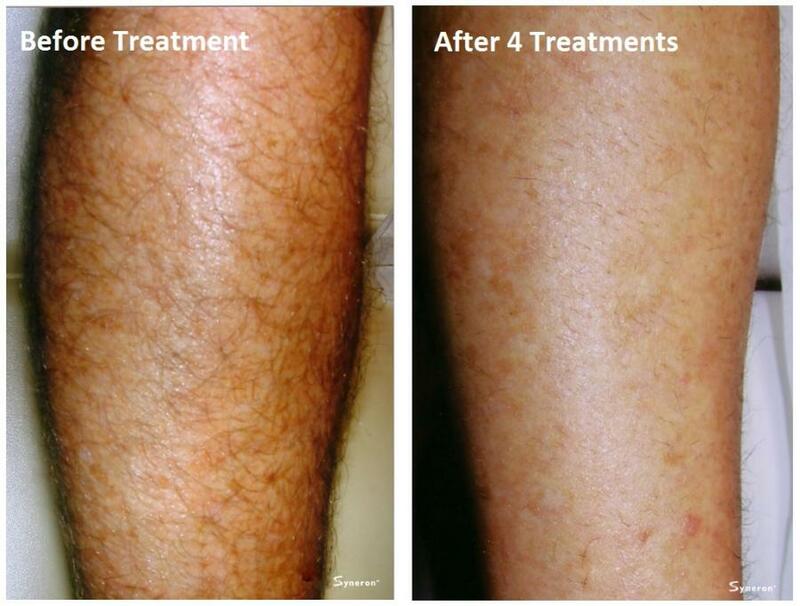 Laser hair removal treatments are absolutely safe! You will be provided with proper eye protection to wear during your treatment sessions. The glasses are specifically designed to prevent any damage to your eyes that may be caused by looking directly at the laser’s intense pulses of light. Advanced cooling technology enhances comfort and safety. Our treatment professionals are highly skilled and professionally trained to use the equipment and the Venus Versa hair removal applicator is FDA approved. Laser and light-based treatments have been safely used for many years for a variety of medical and cosmetic procedures.